Average CEO compensation was $15.2 million in 2013, using a comprehensive measure of CEO pay that covers CEOs of the top 350 U.S. firms and includes the value of stock options exercised in a given year, up 2.8 percent since 2012 and 21.7 percent since 2010. 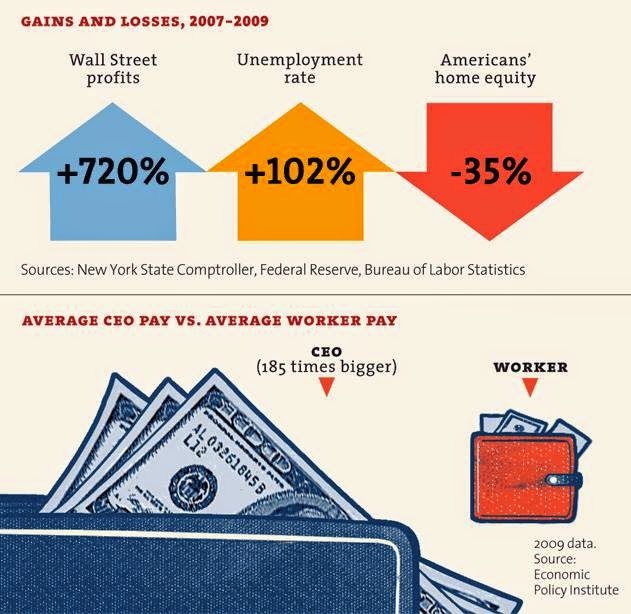 From 1978 to 2013, CEO compensation, inflation-adjusted, increased 937 percent, a rise more than double stock market growth and substantially greater than the painfully slow 10.2 percent growth in a typical worker’s compensation over the same period. The CEO-to-worker compensation ratio was 20-to-1 in 1965 and 29.9-to-1 in 1978, grew to 122.6-to-1 in 1995, peaked at 383.4-to-1 in 2000, and was 295.9-to-1 in 2013, far higher than it was in the 1960s, 1970s, 1980s, or 1990s. If Facebook, which we exclude from our data due to its outlier high compensation numbers, were included in the sample, average CEO pay was $24.8 million in 2013, and the CEO-to-worker compensation ratio was 510.7-to-1.